Discussion in 'All Anniversaries' started by 509thPIB, Nov 6, 2018. Son of William and Selina Gardiner, of Yardley Wood, Birmingham. BRUNSSUM WAR CEMETERY, The Netherlands - grave I. 6. 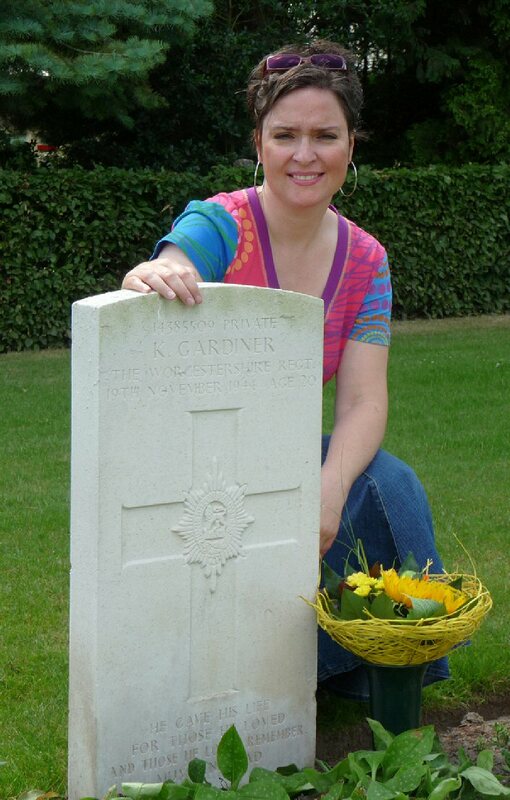 In 2011 the grave of Private Kenneth Gardiner was adopted by Marielle Wiertz, 42 years old, living in Elsloo, The Netherlands. In the above photo she is seen attending the grave in the summer or 2011. His parents were William G. Gardiner and Selina Gardiner (his mothers maiden name was Davis). They married in 1923 at Pershore, Worcestershire. During 1944 they were living in the Yardley Wood, south of Birmingham. 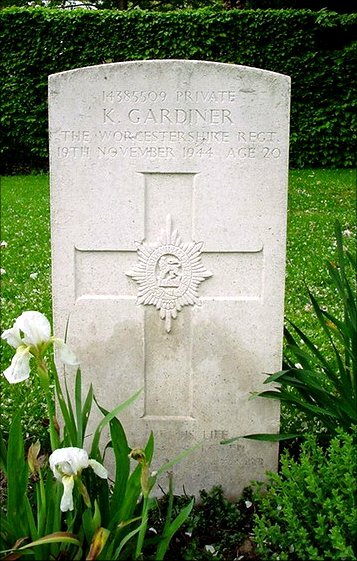 Kenneth Gardiner was their first child and he was born in 1924. Private Kenneth Gardiner was listed as died on the 19th November 1944 but it is very likely that he was among the men of Carrier Platoon that were killed or mortally wounded when they were attacked by two German Self-Propelled Guns as they headed towards the village of Rischden on the late afternoon of the 18th November 1944. The Carrier Platoon was only about 500 metres south-west of the village of Rischden when they were attacked, they suffered 31 casualties (dead and wounded). Many of the wounded died later the same day or the next day the 19th November 1944. During the early morning of the 19th November 1944 the casualties were taken and place in two garages belonging to 4 bungalow houses at the entrance to the village of Rischden. Wondered why you didn't wait until the 19th to post this in the Anniversaries section of the forum. You are 13 days early. I also wonder why you just copy & paste items with no comment from yourself. Why not engage in a conversational way while you are new on the forum. This constant copy & pasting is just spammy in style. It's not really what we do. Tullybrone, Tricky Dicky, timuk and 1 other person like this. There's another site I frequent and one of the posters there is quite prolific, more so than anyone I've ever seen. His approach certainly divides opinion because it feels he's disengaged from any of the subjects he starts. Now certainly in his case he posts links with such rapidity and seemingly absence of editorial process that he's often run foul of copyright infringements on the sites he's linked to, or similar infractions. As a very occasional poster here myself I can hardly claim to be a major contributor to discussions or information. Still there is a certain way of doing things on WW2talk that most of the stalwarts work to and the mods uphold. Posting links to other sites without explaining why you might find them of interest personally does come across as a rather sterile approach to potentially interesting subjects. Multiplication and rapidity of such posts, and I really am only speaking for myself, I find causes me to disengage with author; if they're not interested enough in the subject matter of the post to offer anything more than a single line precis, why should I be? Sites like WW2talk do benefit those who like to talk, ask and answer. Pointers to good information are equally welcome, but just pointing isn't really what the site represents I think? Owen, CL1, Tullybrone and 1 other person like this.